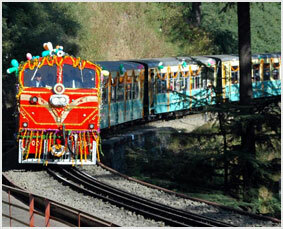 Himachal Pradesh comprises two famous narrow gauge Rail tracks namely Kalka to Shimla and Pathankot to Joginder Nagar. Mini trains or popularly called “Toy Trains” run through these lines, which is the most varied experience for ever person on board. The entire track line passes across tunnels, enchanting vistas, lush green surroundings, local villages and deep down valleys, each of which becharms the onlooker. This 96 km. journey passing through tunnels starts from Kalka and arrives at Shimla. Counted among one of the most unequalled railway tracks in the world, the railway line was opened for the public on January 1, 1906. The Kalka-Shimla Railways are 'The greatest narrow gauge engineering feat in India’ in the Guinness Book of 'Rail Facts and Feats'. The Kangra toy train makes its way through hills & valleys and links Pathankot to Joginder Nagar. Initiated in the year 1926, the rail track came into functioning in the year 1929.